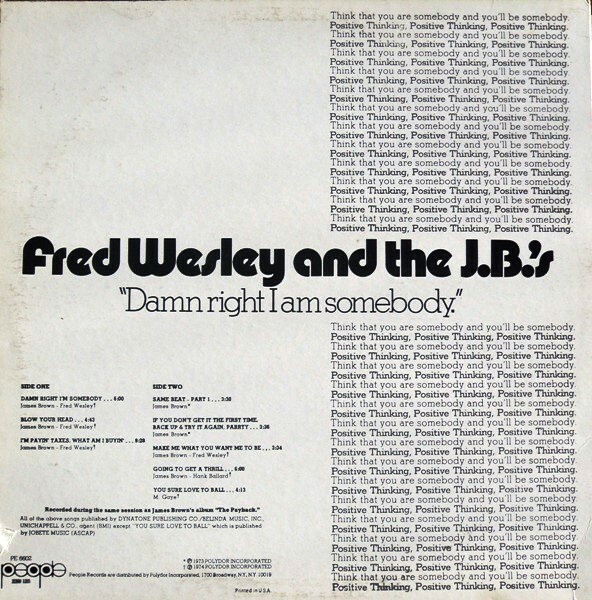 The post Fred Wesley & The J.B.’s – 1974 – Damn Right I Am Somebody appeared first on Funk My Soul. 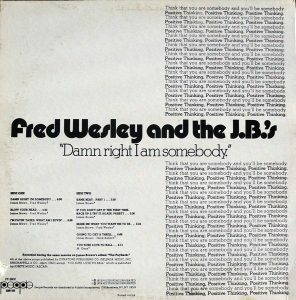 Damn Right I Am Somebody captures the J.B.’s at the apex of their extraordinary powers. This James Brown-produced set is both their most fiercely polemical and their most musically daring, incorporating otherworldly electronic elements, eccentric time and rhythm shifts, and idiosyncratic studio effects to brilliantly articulate the increasing turmoil and insanity of the times. It’s quite possibly the most challenging record ever released under the Brown aegis, favoring open-ended grooves and epic solos rooted in avant-jazz. The rhythms remain surgically precise and hypnotically intense, however, and every cut here, from the funk juggernaut “I’m Payin’ Taxes, What Am I Buyin’?” to the righteously mellow “Same Beat“, is a marvel. 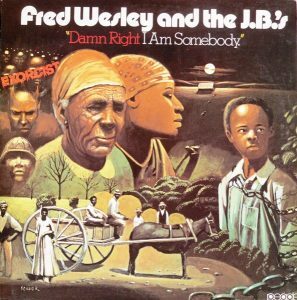 This is funk at its heaviest – musically, yes, but intellectually as well. Stemming from the sessions for James Brown’s seminal ‘The Payback’ LP, the general feel is the same here: heavy duty funk, interspersed with some quieter moments. The title-track is horn-filled extacy, while “I’m Payin’ Taxes, What Am I Buyin‘” is even stronger: street slang and doo-woppin’ interludes break this monster of a jam in several parts. When the drums start thumping and the guitar starts that atypical 4/4 chank, you know the James Brown Soul Train is rollin’. “Same Beat (Part 1)” is another hypnotizing excursion into total funk mode (featuring Jesse Jackson’s famous ‘I Am Somebody’ litany), whereas the bouncing, optimistic “If You Don’t Get It the First Time…” shuffles along relentlessly. “Blow Your Head” suffers from the overpresence of a synthesizer, but thankfully it’s the sole tune here that has been given the super techno-treatment. “Make Me What You Want Me to Be” actually has the slightest sprinkle of Philly Soul to it; a luscious, mellow groove that remains funky due to the loud, boistering drums. Brown had tried to revive the flagging career of his mentor Hank Ballard ever since 1969, and the inclusion here of “Going to Get a Thrill” is a visible attempt at updating Ballard’s 1960 hit “Let’s Go, Let’s Go, Let’s Go“; the rhtyhm is funked up – which is good – and there’s more noodling around on synthesizer – which is pretty bad. The LP ends with a sultry, late nite, sensual jazzadelic instrumental version of Marvin Gaye’s “You Sure Love to Ball“. Great LP, with great cover art as well.